It's almost the end of the month but since this is my first post here this year,let me wish all of you a very happy and prosperous New Year,may this year be full of love and happiness for all of you:)As always,I had made a resolution in my mind to post here at least once in a week,you can see that the resolution has been broken even before I could start trying.No excuses there and I've decided to take it as it comes. So what's a new year post without some sweet,right?These brownies are just the right ones for a wonderful beginning.As regular readers would know,I love brownies.I can say no to anything,even a Chocolate Truffle cake(which is my favorite'est)but not a brownie.A warm slice of brownie with some ice-cream on the side and topped with chocolate sauce,is my idea of Nirvana. 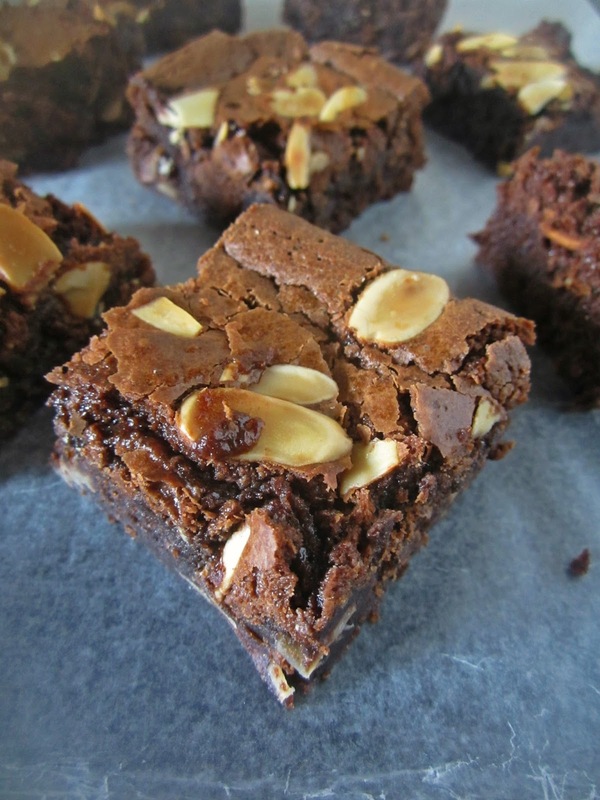 I have quite a few brownie recipes here and this one would top the list of being my favorite(at least for the time being;)Rich and nutty and full of flavor,these are just perfect! Pre-heat oven to 180 degree C. Butter and flour a non stick brownie pan. If using a regular cake pan, line them with aluminum foil and butter the foil. Add Butter and dark chocolate in a heavy bottomed saucepan. 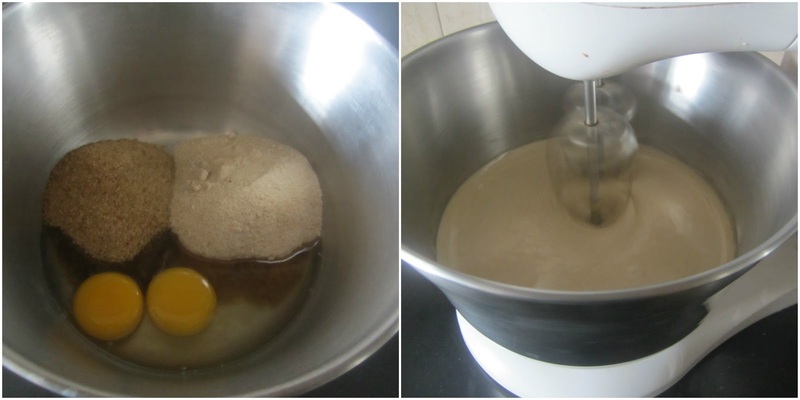 Add eggs, brown sugar and powdered brown sugar in the bowl of your electric beater. Beat on medium high speed for 5 minutes until the mixture becomes pale and thick. Falls back with ribbon consistency and gets frothy. 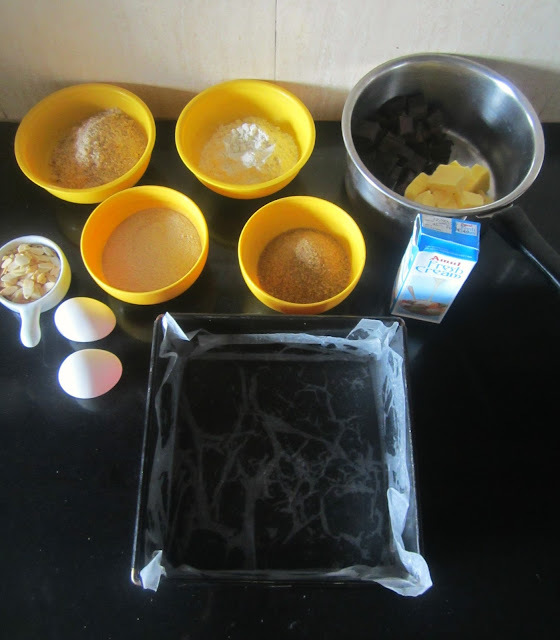 Pour the butter-chocolate mixture slowly and gently, into the eggs mixture as the beater keeps running on slow speed. Beat for 1 minute until the mixture gets fully incorporated. 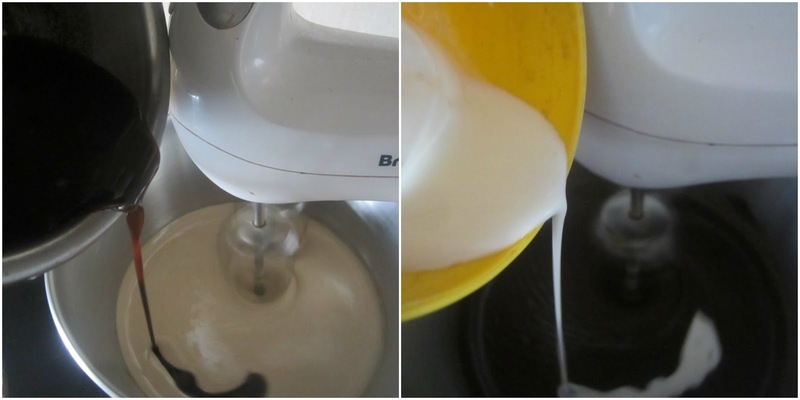 Add the cream into the bowl and beat again for few seconds on medium speed until the cream gets incorporated. 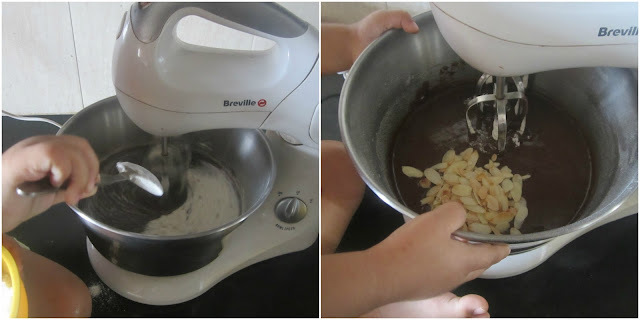 Add all-purpose flour, almond meal and the slivered almonds into the bowl and beat on slow speed just until incorporated. Do not over beat. Pour the batter in the prepared pans. 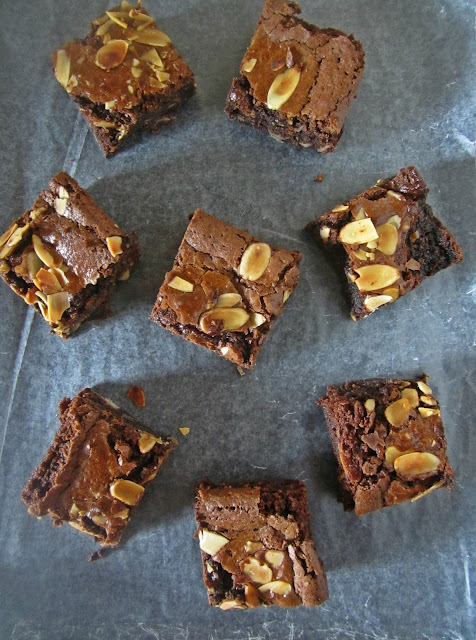 Top them with some of the slivered almonds. Tap gently to release any major air pockets. Bake in pre-heated oven for 20 to 25 minutes until the brownies are springy back to the touch and a tooth pick inserted into the center comes out clean. Try changing the almond meal to any nut meal of choice. You will have some of the best brownies for life. Pour the batter in the prepared pan. Top them with some of the slivered almonds. Tap gently to release any major air pockets. 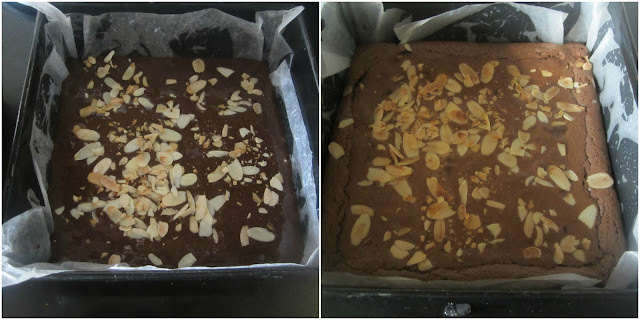 Yum...The brownies look sinfully rich.. would love to have it warm with a scoop of vanilla ice cream.. Are those little Arjun's hands? 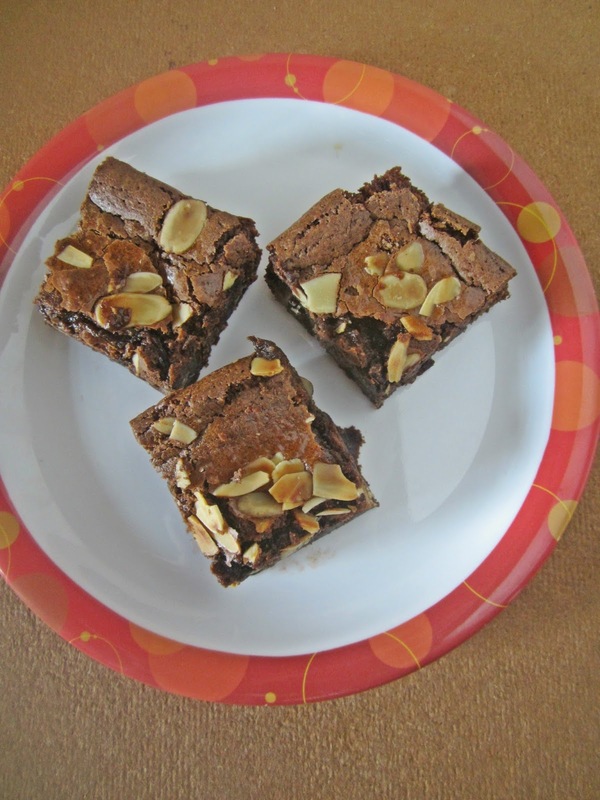 I just fall in love this sweetii brownies. Love and love.